This week has seen this phase of the construction coming to a close. The shade structure (we really need a better name for it!) completed and they have been working on the new demonstration table. Let’s take a look! Picking up where we left off last week, the next step was to top those beams with more metal bracing and then start putting the first layer of boards between all those main beams. Next was a layer of boards on their sides, with the ends cut decoratively. Every layer adds more shade! Oops! 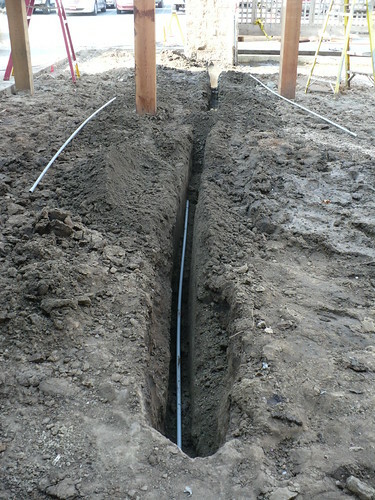 Hit the main irrigation water line. This re-flooded the just-dried-out south lattice end of the garden, preventing additional work on the drainage lines and preparations for getting the pavers in. Luckily that didn’t stop other work going on! 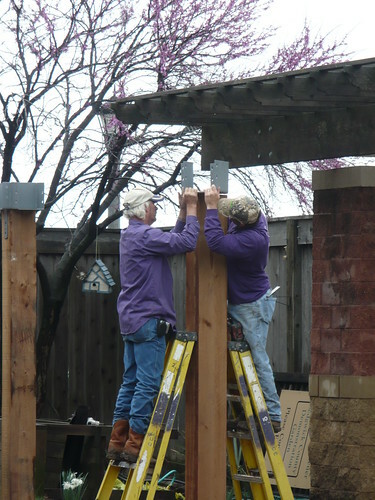 The crew was on to the third and final layer of boards for the shade structure. 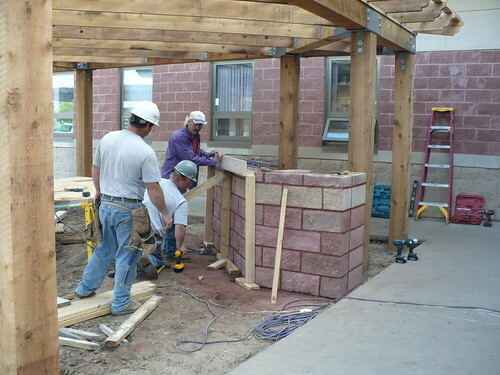 As the final touches were going on to the shade structure, they started work on the demonstration table. 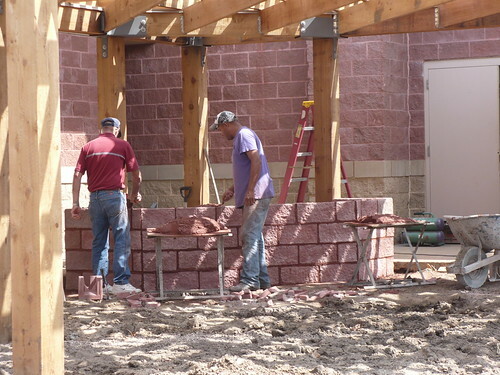 The concrete pad was scraped off to remove the mud from the last week, and they started bringing in the block. They made quick work of the demo table! The red block matches the block on our building. 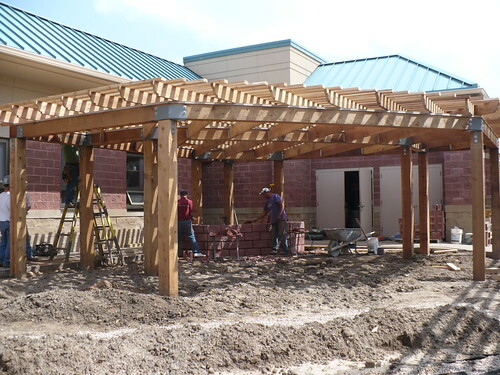 Taking a step back, you can see the full effects of the shade structure. It will be so much nicer to be under there for classes rather than out in the full sun! 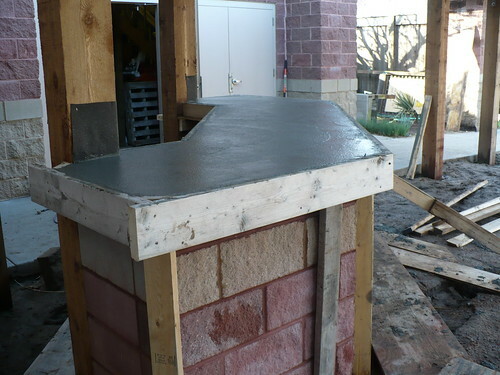 Once they had the block laid for the demonstration table, they put up the frame for the concrete top of the table. If the table seems high, that’s because it is. It will be 42″ tall, and then a platform will be built behind the table to elevate the speaker a little bit to a comfortable height on the table. Of course with the thunderstorm that went through last night, the southern end of the garden is pretty soggy again, continuing to delay fixing that water line, putting in the final drain line, and beginning the work of laying the pavers. UGH. It looks like it is supposed to be sunny and dry all next week, so we should make progress on the rest of it! 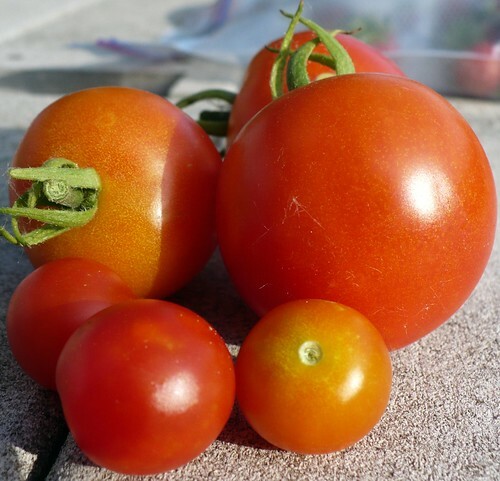 Continuing on with our discussion from Monday about planting tomatoes and other warm season vegetables early, I want to take a look at what some of the long-term predictions are for the weather this summer. Of course, one reason that everyone is thinking about planting early is just because the weather is so nice…like we expect April and May to be. As gardeners, we’re programmed to pay attention to the weather and plant when it seems right, with some guidance from the calendar and common sense. It stands to reason that we would want to plant now! The other reason that so many gardeners are anxious to get their tomatoes planted early is because they are certain that the hot summer followed by a warm winter means we are guaranteed another scorching summer. We’re all desperate for some good tomatoes, and if planting a month early will do it, then let’s go! I think it is interesting that the widespread assumption is that the 2012 summer is going to continue the trend of way-above-normal temperatures and continuing to be dry. After the winter of 2010-2011, where we hit low temperatures we hadn’t seen in years, we didn’t all assume that the summer was going to be record lows! If growing up on a farm, working on farms, and now being in Extension has taught me anything, it is that you don’t try to predict the weather, especially based on what you are currently experiencing! I’d like to share a couple of general long-term weather forecasts from 2 very different sources. Then we can revisit the issue at the end of the summer and see if either (or both) turned out to be right. Their most recent long-range forecasts (from March 15th) show an “Even Chance” for above, normal, or below average temperatures and rainfall. The skeptic in me says that means they have no clue which model is going to be right! Still, that doesn’t seem to agree with the assumption that we’re in for another very hot, very dry summer. The other forecast is from a source that generally makes me rather twitchy as an Extension Agent making research-based recommendations. That source is the Farmers Almanac. I don’t plant by the Farmers Almanac, never have, and probably never will. I don’t recommend other people plant by the Farmers Almanac either. However, I was in a local garden center last week that had copies and thought it would be interesting to check out what it said about the long-range summer forecast, given that I had already seen the K-State early model projections. This is the closest I am ever going to come to predicting the weather on this blog. I think it will be very interesting to look back after the summer and see which (if any) of these predictions are correct. I have to be honest that I would be very much in favor of a cooler than normal and wetter than normal summer after last year! How Early is Too Early to Plant? How do we decide if we should plant early or wait until the usual planting time? Is it okay to plant some things early, but not others? I think it is important to remember that however warm it is on a given day or week in the early spring, that doesn’t prevent a cold snap before the beginning of May. Thinking back to 2007, many parts of the country experienced a warm, early spring followed by a swift dip down to well-below-freezing temperatures. We certainly do not want to set our vegetable gardens up for failure by planting too early. In the Demo Garden, we really are not presented with this question this year, as we will not have all the raised beds and soil in place and ready to go before sometime in May. My thought on planting early is that in a spring like we have been having so far, it would be crazy not to take a little risk and try planting earlier for some crops. What I plan to do in my community garden plot is to plant my tomatoes around mid-April rather than wait for May 1st. However, I am not just going to blindly go out and plant on April 15th! Conditions have to be right. First, the long-term forecast for the 2 weeks between April 15th and May 1st should look nice and warm. If there is even a chance that it is going to get below 35-40 degrees one night, I would rather wait to plant. The other key factor is that I want the soil temperature to be nice and warm. As of this writing, the soil temperature was measured at 57-60 degrees on March 20th! However, with cooler temperatures and rain, that can drop. Tomatoes need at least a 55 degree soil temperature to thrive. Right now it is looking good, but I want to make sure it stays that way. The last thing is that I need to be prepared to provide some protection for those tomato plants if temperatures do dip down into the 30s. How about other vegetables? Theoretically, when the soil temperatures reach 60 degrees peppers, eggplant, squash, melons, okra, and most other warm season vegetables can be planted. These vegetables really love the heat, so I will tend to wait to plant most of them until closer to May 1st. Likely it will not get cold enough to severely damage them, but they will grow better when the weather is consistently warm. Again, you can take a chance and plant earlier, just be prepared to provide some protection and replant if necessary. I have some thoughts about the summer long-term forecast that I’ll share later this week. Stay tuned! With all the rain (and corresponding mud! 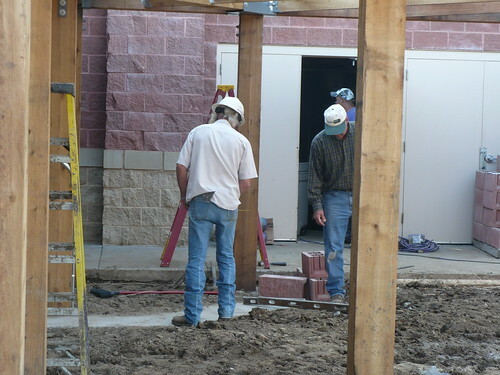 ), the construction progressed much slower this week. 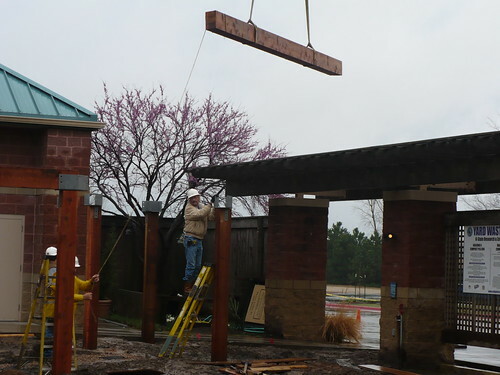 During one of the breaks in the rain at the beginning of the week, they removed all the supporting lumber from the main posts. The next step was getting all the posts cut to exactly the right height and fitting them with these metal brackets (braces?) 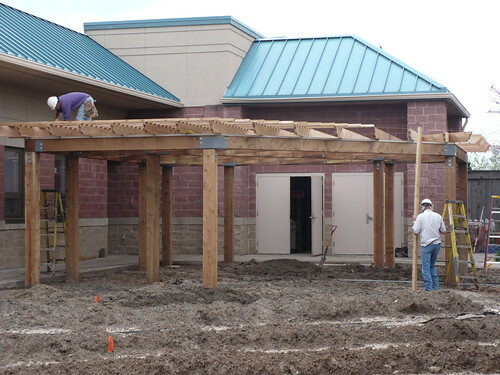 that will hold the main beams on the roof part of the structure. 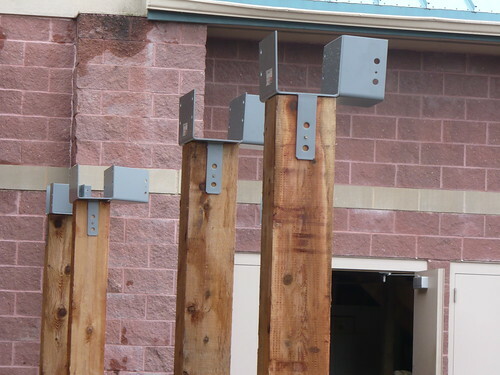 Another look at the brackets fitted to the posts. Yep, that’s right. We have a crane! I don’t know about you, but I think I would have wanted a bigger hard hat! 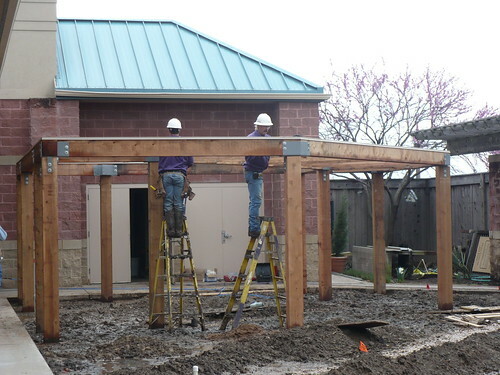 All the same, just imagine how much work it would be to lift those beams in place rather than lower them with a crane. 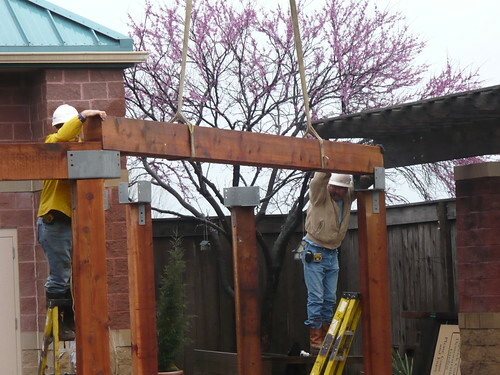 Having the crane do the heavy lifting makes it easier to get the pieces fitted just right. 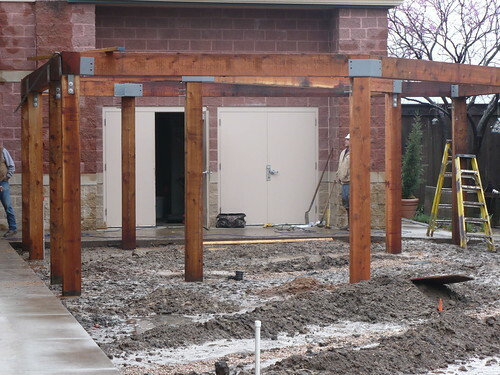 In a matter of a few hours, all the main beams were in place! The crew spent the rest of the afternoon getting all the bolts and screws in place so everything was secured rather than just sitting in the brackets. 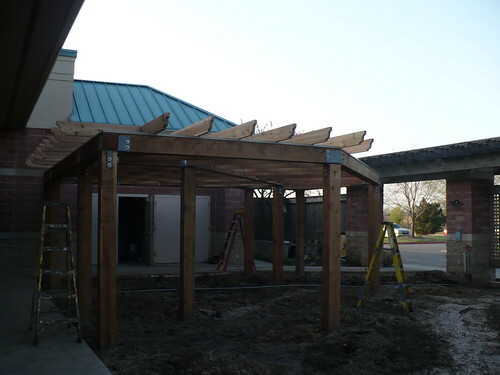 Today they have been putting metal peaks across the beams and started putting some of the slats in between the beams. In our Mexican Garden this year we are going to make an attempt at growing Jicama. You may have seen it in the grocery store – a big, tan tuber with crunchy white flesh. (Yeah, I know that describes a lot of tubers.) 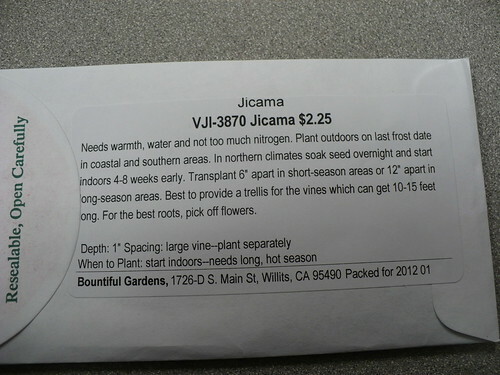 Jicama is a vining plant that produces the edible tubers at the end of its growing season, which is typically 7-9 months. Obviously we are borderline as far as getting a crop here! We got the seeds from Bountiful Gardens, and even though we aren’t sure when we’ll be ready to plant outdoors, I decided to get these seeds going. It’s going to be tight getting them to produce this year anyway without creating any further delay. If they get too big before the garden is ready, we’ll just have to put them in a pot for the time being. Before starting, read the back of the seed packet! There’s all kinds of good information there! For instance, we learn that it is best to soak the seed overnight before planting and to plant the seeds 1 inch deep. 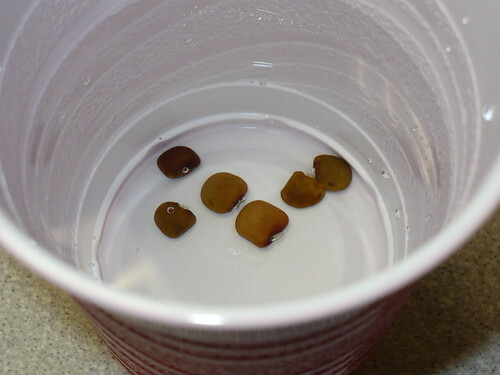 Here are the seeds soaking in a cup of warm water. I started with the water probably about 95-110 degrees. (Same temperature as for yeast when you are making bread!) It cools down as it sits, but no need to change the water. The light stand is finally looking less barren! It has had a much longer break than usual this year. I also planted the seeds for the Thai Red Roselle (Edible Hibiscus) and for the Thunbergia (Black-Eyed Susan Vine). Next week we will hopefully start some hanging basket tomatoes to hedge against not getting the garden planted in a timely fashion this year. 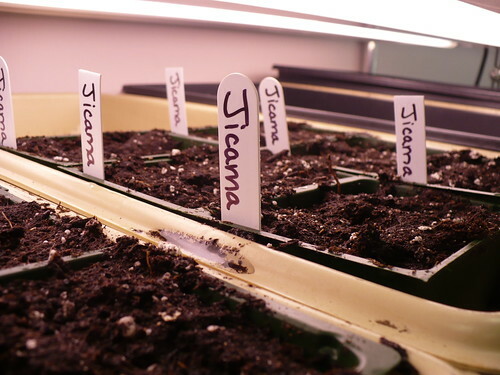 In a couple more weeks, we should be ready to plant the bulk of the tomato and pepper seeds – IF it looks like we are likely to have the garden ready to plant by mid-May. 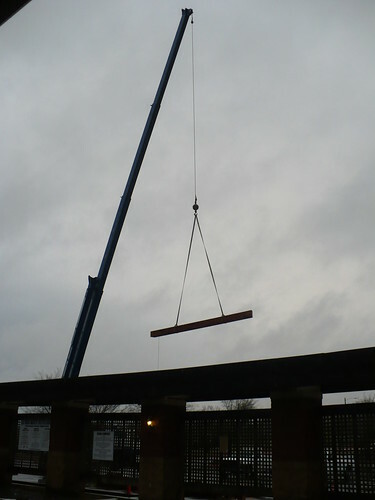 They have been making good progress on the classroom area structure, despite the rain. 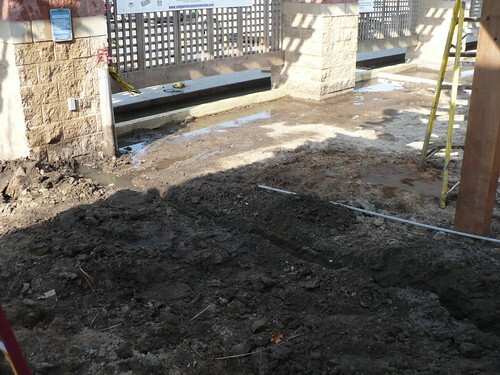 However, I suspect it will be several more days before it is dry enough to even think about laying pavers.